More traction gives you more confidence, and with the Women's Ruze, you get just that. It's specifically designed from the ground up to give women of all skill levels an advantage on the trail, earning it the nickname of "the ultimate trail hardtail." The 6Fattie wheel system is paired with a design that makes climbing fast and efficient, while keeping things full-throttle on the descent. It's also tailored for women, with Women's Trail Geometry, a Body Geometry Myth saddle, and components that are specifically sized for women throughout the line. M4 Premium Aluminum proved to be the right material for the job, allowing a lightweight, durable frame with our Women’s Trail Geometry that’s equal parts snappy and efficient on climbs and descents, while maintaining an ultra-low standover. SRAM X7 rear derailleur is precise and strong, so it can face down rock gardens and rough trails while still providing accurate, reliable shifting. 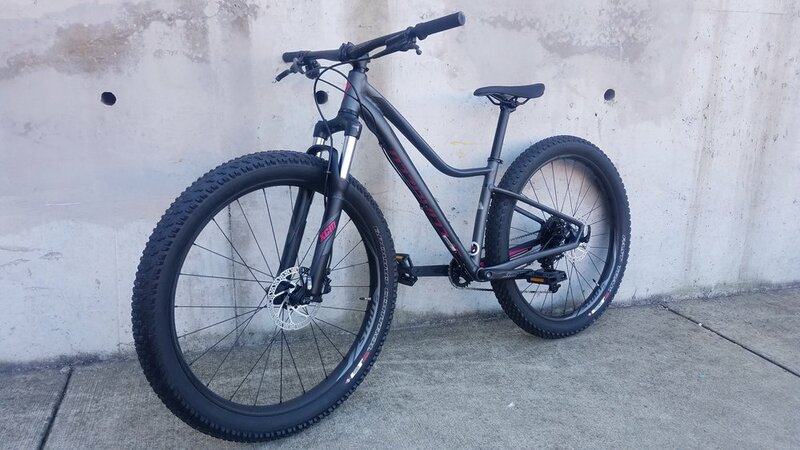 The next bike up in this Ruze Lineup is the Ruze Comp 6Fattie. If you're looking to get a better idea behind how the Ruze performs, click the button below for a great review from bikeradar.com on the Ruze Comp 6Fattie.